Robust process reliability: The proven and future-proof components enable reliable and reproducible processes. Perfect interaction: Well-coordinated components guarantee reliable operation of the brewing process. Time saving: Automation of the process steps saves the pilot brewery a considerable amount of time, which can be invested in other activities. Easy start-up: Thanks to the excellent cooperation between all those involved, start-up went very smoothly indeed. The pilot brewery of Weihenstephan’s research centre for brewery and food quality has been modernised. Automated flowmeters, process control valves, solenoid valves, pneumatic actuators and “smart” valve islands make manual adjustments unnecessary. This not only saves time, but also enables monitoring of the recipes developed or tested here possible at any time. The control system is kept so simple that the master brewer can create, operate and modify recipes from a PC using an Excel spreadsheet. The pilot brewery of Weihenstephan’s research centre for brewery and food quality enables the creation of pilot brews for all kinds of beer, fermented malt drinks and mixtures. Pilot brews are prepared both in the name of research and on the basis of orders, ultimately resulting in drinks for consumption. 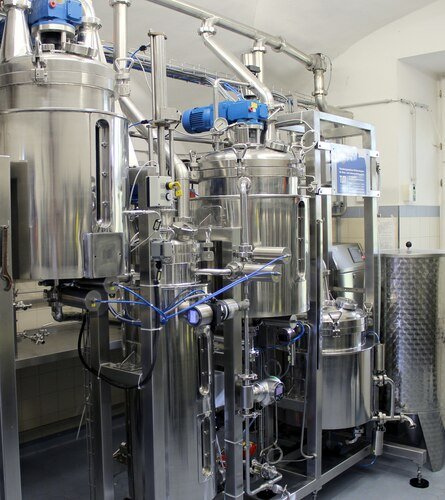 This process starts with the mashing, brewing and fermentation processes through to the testing of suitable yeasts, microorganisms, ripening processes and filtration capabilities. The pilot brewery has an output of 50 litres of wort and a capacity of nine fermentation tanks capable of holding 60 litres each. Beyond that, the brewhouse and the lautering process of the “mini brewery” are no different from those of a larger facility. “Until now, most things were adjusted manually,” explains the Weihenstephan research centre. This applied to the control valves in the water intake for mashing and sparging, to the control valves for the lautered wort and to the pump used to drain the wort tank or to adjust the height of the rake arms. “There wasn’t even any scaling here and the rake motor always ran at the same speed,” they said at the research centre, reflecting back. To achieve a better basis for future research work, those responsible at the research centre decided it was time to modernise the plant automation. However, the decision-makers felt it was important to be able to intervene in the system at any time, even after its modernisation. With ATN GmbH, the small brewery picked a competent partner that has developed multibrauplus®, an automation solution specifically tailored to small and medium-sized breweries. Based on a Simatic S7 from Siemens and graphical visualisation, all the functions – from malt storage bins to fermentation cellar – can be automated. Despite this, the brewers are still left with sufficient leeway to take decisions, since Excel was deliberately chosen as the dialogue medium with the process control system. The “programming” activities are limited to filling out a standard text list, which is then interpreted by the process control. The monitors, calculations and control functions included in the commands are managed by the process control alone. However, a process control alone does not make automa­tion possible; since automatic control valves, flowmeters and pneumatic actuators are required to automate existing manual valves. The fluidic system expert Bürkert supplied and installed the required hardware for the fluidic systems, handled the installation of the wiring and hoses, and supported start-up. The range of applied fluidic components covers the process control valve used for the steam needed to heat the mashing and wort tank, the temperature controller on the wort cooler, various flowmeters and a valve island mounted in the control cabinet that is used to control all of the valves installed in the process. The height of the rake arms of the lauter tun is now also adjusted automatically using a solenoid valve. The existing flap valves were overhauled and equipped with pneumatic actuators. Furthermore, there is also a brewing water storage tank in which the water can be precisely blended using a modular blending unit. The entire pneumatic system is controlled by a valve island. This is directly installed and shipped in a stainless steel, hygienically designed control cabinet with the stainless steel control AirLINE Quick base plate to save space. “The stainless steel control cabinet is well suited to our small pilot brewery. All of the valves also have a P-channel shut-off mechanism, which means they can be switched out even while the machine is in operation without shutting it down,” claims the Weihenstephan research centre. For the pilot brewery, the investment in cutting-edge automation technology has paid off. A high degree of reproducibility and traceability is simple with this solution, as data acquisition is integrated into the control system. Product-specific information can be displayed graphically along with other measured values. Thanks to the fruitful partnership, the system was prepared for start-up quickly and easily. “The training time was also short, because all those responsible quickly got used to the Excel spreadsheet system,” concludes the research centre.